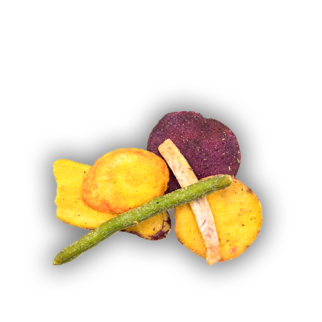 Red River’s vegetable chips are a crunchy mix of green beans, carrots, squash, taro, and sweet potatoes. The vegetables are picked at peak freshness, boiled to preserve flavor and color, dehydrated, and cooked in vegetable oil. With 40% less fat per serving than regular potato chips, Red River vegetable chips are offer a natural, healthier alternative.